This is Caleb with his third acoustic guitar built totally from scratch. The top is Sitka Bearclaw Spruce, the back and sides are Cocobolo Rosewood. 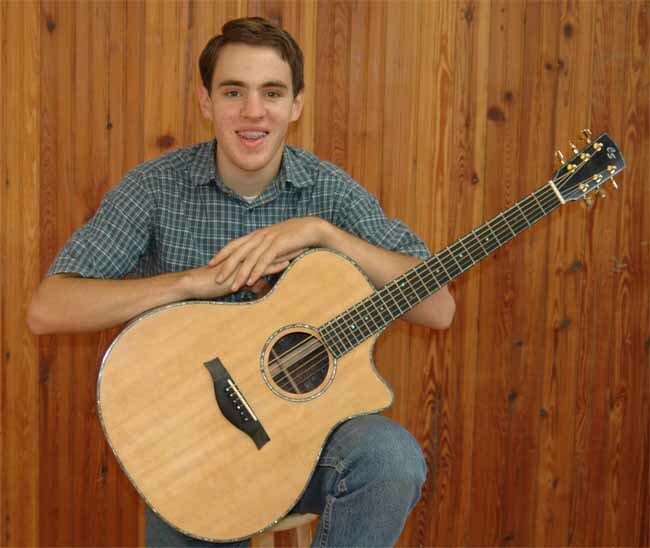 He has played guitar for 11 years and in 2002 he decided to merge his two hobbies of woodworking and music. Since then, he has worked to incorporate the precision techniques of guitarmaking into his general woodworking, resulting in higher quality products for his customers. Caleb's first guitar took him about 310 hours to complete. His second, 125 hours. This third instrument is similar to his second, however it is inlayed around all front facing edges with paua abalone shell, which added about 60 hours to the project. He put the finishing touches to this guitar on November 22nd, 2007. He is now, in his "spare time", working on a f-style mandolin, which he started playing in 2004. Pictures will be posted once its done. Copyright © 2016 Mesquite Valley Woodcrafts All Rights Reserved.